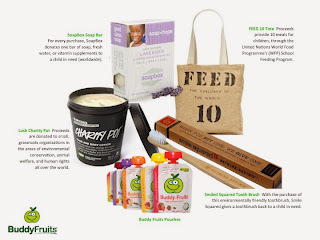 7 Kids and Us: Buddy Fruits "Spread the Good" Challenge and Giveaway! Buddy Fruits "Spread the Good" Challenge and Giveaway! Buddy Fruits has decided to embark on a mission to remind those people that there is a lot of good out there! That is why we created “Spread the Good” Month – a month dedicated to paying it forward, to smiles, and to always doing a little good, everywhere and anywhere. During this month, our goal is to encourage others to spread the good with Buddy Fruits. We want to remind them that unexpected kindness can brighten someone’s day! Some great ways you can "Spread the Good"
Change your cover photo to support your favorite charity. We’ll change it too! Do something nice for your neighbor. Smile or compliment a stranger. Let someone go in front of you in a long line. Catch up with an old friend – treat them to coffee or lunch. When someone tries to repay you for something, ask him or her to pay it forward. Leave someone a love note. Give up your seat for someone who needs it more. Post an inspirational quote for your friends or family on Facebook, Twitter, or Instagram. Write a “thank you” note to someone who provides a service. Volunteer! At a breakfast program, animal shelter, a community race, etc. Leave an encouraging Post-­‐It note in a library book or other random place. Bring or bake a treat to work and share with your coworkers. Send a box of donuts, bagels or muffins to a construction site. Offer the FedEx, UPS or DHL delivery person something warm to drink on a cold day, or something refreshing on a warm day. Share an umbrella with someone on a rainy day. Praise someone at work for doing a good job. Plant trees or flowers in a neglected area of your neighborhood. Leave a nice note for your waiter or waitress at a restaurant. Bring your well-­‐behaved dog to visit a local nursing home or children’s hospital. Bring your partner or kids breakfast in bed. Leave someone flowers on their doorstep. Buddy Fruits has also partnered with Feed the Children, an organization dedicated to combat hunger and poverty. We will be donating almost 800,000 Buddy Fruits pouches during this time of the year, in Thanksgiving gift boxes for families in need, at Thanksgiving events, and to different food banks all over the United States! One reader is going to win 2 (yes 2!) "Spread the Good" baskets as shown above. One to keep, and one to give to a friend! To enter, ..just do 2 things on the list, and place pictures showing you did them in a Facebook album called "spread the love". Then, leave me the link, and on 12/12/13 I will announce the (random) winner.